This action-packed martial arts triple feature opened 30 years ago today (August 26, 1983) at the street-level Rialto I, corner of 42nd Street and 7th Avenue. We're pretty sure we can identify the second and third features -- YOUNG HERO is MI ZONG HUO YUAN JIA (1981), while BRAWL BUSTERS appears to be a William Mishkin re-titling of SI DA MANG LONG (1979), a.k.a. 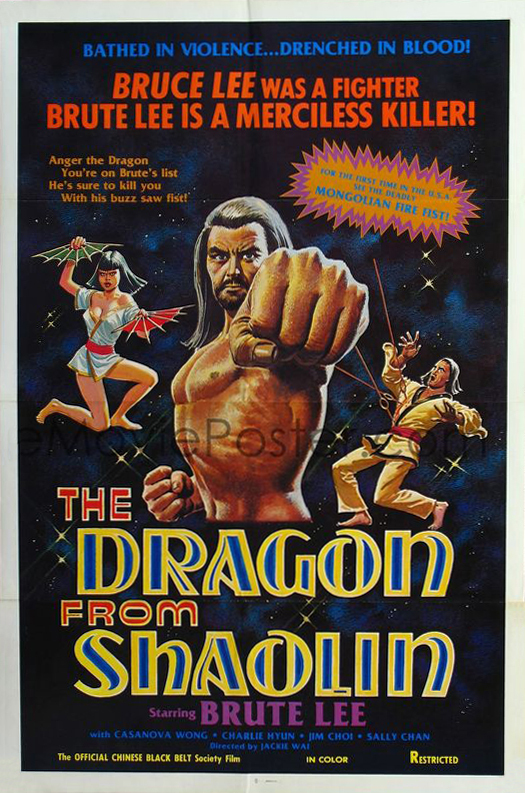 BRUCE AGAINST THE ODDS and LONE SHAOLIN AVENGER -- but top-billed THE SWORD AND THE CLAW is the real mystery. 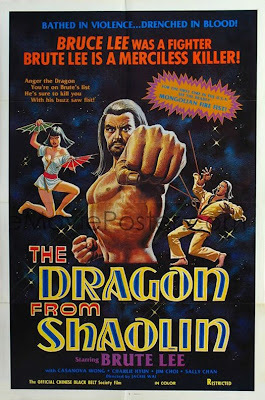 The artwork is cribbed from THE DRAGON FROM SHAOLIN, the U.S. release of JIN HU MEN a.k.a. MAGNIFICENT WONDERMAN (see below), so it could be a re-titling of that movie...or it could be a completely different movie. More clues, please! 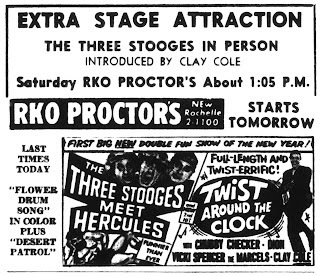 The Three Stooges (Moe, Larry, and Curly Joe) appeared at the RKO Proctor's theater in New Rochelle on Saturday, January 27, 1962 to promote the release of their third feature and biggest box-office hit, THE THREE STOOGES MEET HERCULES. Clay Cole, the popular disc jockey, songwriter, and host of the TV dance program THE CLAY COLE SHOW, not only introduced the Stooges that day, but also appeared (as himself) in the co-feature, TWIST AROUND THE CLOCK (1961). Q: "How do you get a super secret agent into Albania to spring some big shots out of there?" A: "Form a pop musical group and get invited to Albania!" THE PHYNX has the reputation of being one of the worst major studio releases of the past 50 years, but it isn't that bad. We'll even go out on a limb and say that 30-40 minutes of it are actually pretty clever and funny (especially the scene with Larry Hankin as record producer "Philbaby" and a backlot musical number that seems to be referencing "This Boy" from A HARD DAY'S NIGHT), leading us to the conclusion that George Foster & Bob Booker's story would've worked better as one of their comedic concept LPs rather than a feature length movie. 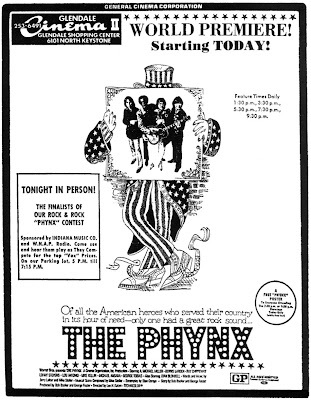 A rare 35mm screening of THE PHYNX is happening tonight at the Cinefamily, but if you're like us and you don't live in L.A., you'll have to make do with the Warner Archive DVD-R and this insightful blog post by our friend Marc Edward Heuck. 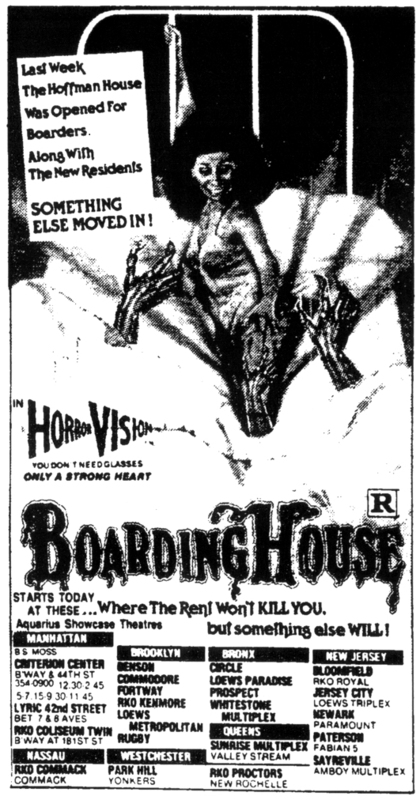 John Wintergate's micro-budgeted horror picture BOARDINGHOUSE was shot on Betacam video and then transferred to 35mm film for theatrical release through Howard Willette's Coast Films, circa Halloween '83. As with other Willette presentations (RITUALS, TEEN LUST), Aquarius Releasing handled sub-distribution when the film opened in the New York area (March 2, 1984). Incredibly, a new 30th anniversary DVD of BOARDINGHOUSE from Slasher // Video contains a 157-minute director's cut (! ), which the intrepid William S. Wilson reviewed a couple of weeks ago at Video Junkie Strikes Back from Beyond the Grave. Gary Kent's independently shot "adventure through consciousness" opened in two theaters in San Antonio, TX on September 24, 1976. 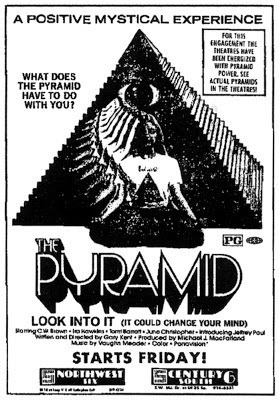 "What does the pyramid have to do with you?" Order the special edition DVD directly from Gary and find out. Look into it. It could change your mind.